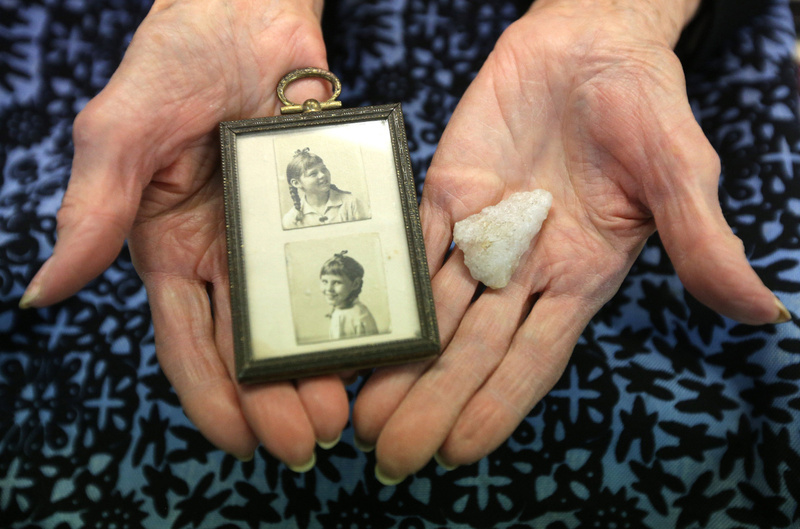 Jeanne Carter was a little girl in 1935 when the 10-year-old spotted an interesting stone object walking on the road towards Toronto’s historic Fort York, newly opened as a public park after centuries as a military installation. She picked it up, noted its neat triangular shape, mused that it might be an arrowhead of some kind, a souvenir perhaps, put it in her pocket and went about her business. She continued to go about her business for eight more decades, keeping the little object for all that time in her mother’s handsome long mahogany box of assorted treasures and knick-knacks. That field trip to the new Fort York park turned out to be even formative that she realized. As an adult, Carter’s love of history inspired her to volunteer for the Royal Ontario Museum (ROM). In 1957 she co-founded of a volunteer committee at the museum and led tours to countries all over the world. Today at 92 years old, she is the longest-serving volunteer at ROM. 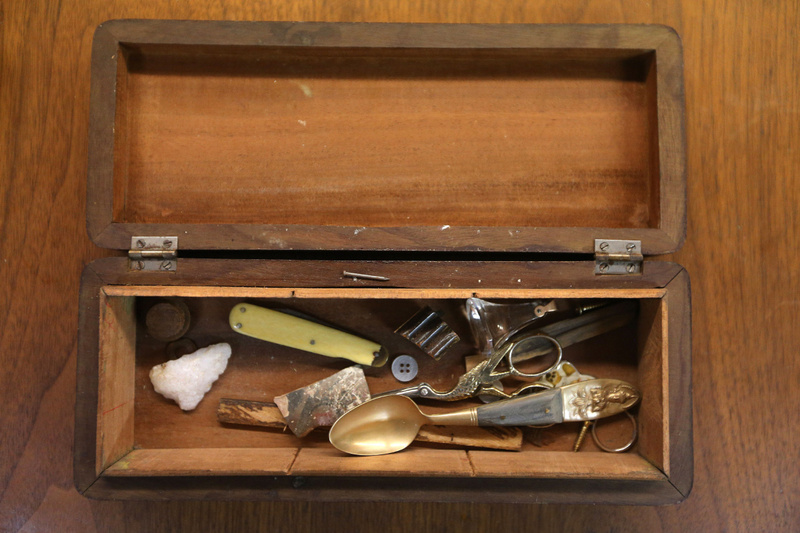 On a whim, because she had no idea just how much of a treasure her little treasure was, Jeanne Carter had the arrowhead examined by a historian friend. 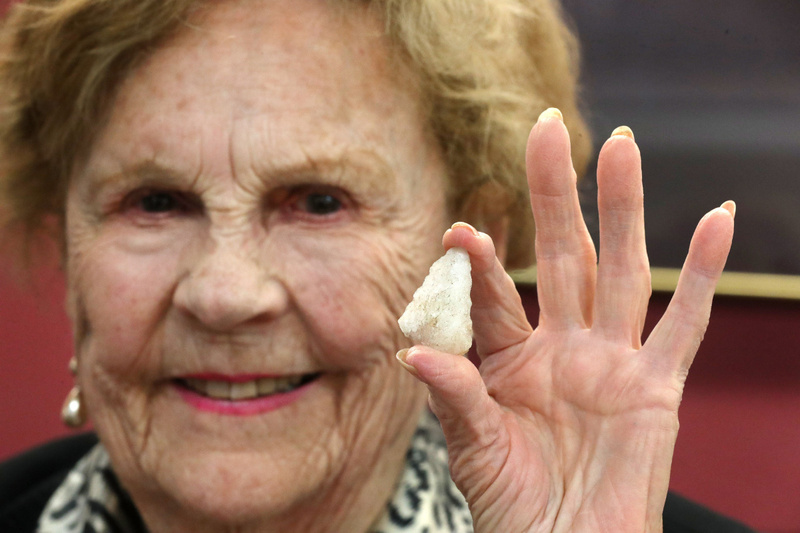 “I thought it was an arrowhead or something, but nothing more than a souvenir,” said Carter, now 92. A few weeks ago she learned it is not only an arrowhead, but also between 4,000 and 6,000 years old, originating from some of the region’s first Indigenous people from the Archaic period (8,000 to 1,000 BC). “I nearly fainted,” Carter said of when she heard the news. Her friend passed the arrowhead along to city historian Richard Gerrard who confirmed its advanced age and some unusual qualities. The arrowhead, with slightly rippled, sharpened edges, would have been attached to a wooden shaft and used for hunting, but because of its age, it’s impossible to know what tribe would have used it, or any other details, said Gerrard. Ancient arrowheads are not a common find in the area, not now and not in 1935. Only four total are known to have been discovered at Fort York, and the other three were all unearthed by archaeologists in official excavations. Unlike the archaeologists, Jeanne didn’t dig an inch to find hers. Historians think her smashing find was the result of construction work at Fort York. In 1935 the site was transitioning from active military to site to public part, so it’s likely that installation of infrastructure like a water or sewer pipe happened to churn the soil where the arrowhead lived and bump it to the top of the road for a little girl to treasure for her whole life. She has been an outstanding custodian of the artifact, keeping it excellent condition and out of the digestive tracts of a number of children and grandchildren. When she realized how important it was, she immediately gave it to the city. The arrowhead is now among the more than 1 million historical objects and archeological artifacts held by the city. The vast majority are in storage, while some are on display at the city’s 10 site museums, like Fort York. Many of the city’s artifacts were found in archeological digs at historic sites or development projects throughout Toronto, and will be held and preserved indefinitely. The arrowhead is so special it will be one of the select few objects that go on public display. It is destined for exhibition at Fort York, probably summer of 2018, where Carter plans to be the first in line to visit it. Meanwhile, another historic fort on the opposite side of the continent is doing something too cool not to report despite its utter lack of connecting thread to the above story. Fort Vancouver National Historic Site in Vancouver, Washington, is offering 19th century sabre training classes to the public. The sword was used by Army mounted dragoons in the 1850s and there were Army dragoons garrisoned at the fort at that time. Historians have confirmed that the men of E Company of the 1st Regiment of Dragoons were transferred to Fort Vancouver from Southern Oregon in 1855, likely fresh from the fight in the Rogue River Indian Wars. They were stationed there for about a year before being sent to Walla Walla where they built the eponymous fort. That means when you sign up for Basic 1 (footwork, solo and partner drills, offensive cuts and thrusts, defensive guards and parries) or, for the more advanced student of the bladed arts, Basic 2 (more and harder solo and partner drills, perfecting technique), you’ll be tracing the steps of long-gone infantrymen, learning a skill that was their bread and butter even before the Civil War. The classes will be held on seven consecutive Sundays from January 21st through March 4th. Basic 1 classes start at 3PM; Basic 2 at 5PM. The both run an hour and a half long. The fee is $100 per course, payable to Academia Duellatoria, a Portland historical fencing school whose staff will run the classes. Payment must be made by check or PayPal before classes start. (Contact Jeff Richardson of Academia Duellatoria at 503-888-9310 or by email) to book your spot. Training sabers and protective gear will be provided. Here’s the best part: Anybody who sees both courses through to the end can join the fort’s team of volunteer reenactors at living history events. The class isn’t just a mechanical lesson on saber rattling. The whole point is to teach students about how the weapon was used by dragoons in the 1850s at Fort Vancouver and elsewhere, all the historical background you’d need to be able to relay to visitors in a reenactment scenario.